The building was opened in 1895 as a junior day school, The Morton Road School and it was in this capacity that it remained until the outbreak of the Second World War. When the war ended in 1945 the school was not reopened and the building sat out of use until the 1960s when it was converted into an arts centre by Suffolk County Council. Given the name “The Seagull Theatre” by the local acting group “The Seagull Theatre Club” (who got the name from the play by Anton Chekhov), it remained in use as a theatre and Arts College until funding was withdrawn in 2006. The building was closed, the windows were boarded up and the developers called in. As a result of this the SOS (‘Save our Seagull’) group was formed, the patrons of which are Oscar-winning actress Dame Judi Dench and Desmond Barrit who pledged to support campaigners fighting to save their theatre. A local resident stepped in to buy the building from the council and turn it into a Community Interest Company as “The Seagull”. 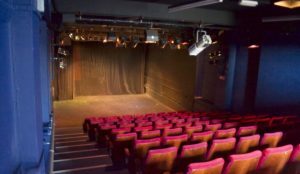 With the help of volunteers we reopened at the end of February 2009 and have re-established ourselves as an important performing arts venue, offering a diverse range of shows, classes and workshops. In addition to our Auditorium, we have three studios upstairs that provide space for local groups to rehearse or functions to be held. Work continues to upgrade this local gem with new windows replacing wooden boards on half the building, new technical equipment and several new coats of paint! Since we are a ‘not-for-profit’ organisation run predominantly by volunteers, all this has been achieved with the support of the local community, supportive businesses and generous individuals. Please contact us anytime and our dedicated team of volunteers will endeavour to assist you with any queries and ideas that you may have. The Seagull is YOUR community venue, and we need to work with and for you to ensure this vital resource continues to thrive and contribute quality programming, facilities and opportunities to the area.